Scroll down to see list of drain rock with pictures!!! We only carry the finest in quality: When it comes to our drain rock we carry only the best. If doing large projects you will need to remember that rock color, and sometimes overall texture, may vary from what you have. This is sometimes a result of the rock at your location being weathered where as drain rock that has just been screened and washed will often be brighter in color but this will change in a few short years. If color matching of existing drain rock is important to you then you may want to come and see the samples that we have to get a better idea of what you are looking for. Delivery of quality drain rock to all areas of Seattle as well as areas of the Eastside like Bellevue, Clyde Hill, Hunts Point, Yarrow Point, Mercer Island, Kirkland, Redmond, Newcastle, Issaquah, Snoqualmie, Preston, North Bend, Sammamish, Maple Valley, Renton, Maple Valley and more. Yes!! We Carry Drain Fabric Too!! Have it delivered with you gravel order! Call or email for questions on drain fabric sizes and cost. Check out our Tools & Gardening Supplies page. How Much Drain Rock Can I Get? We sell our Drain Rock by the cubic yard and we can deliver up to 11 yards at a time but if you need only one we can delivery that too. We do not have a minimum. How ever big or small we will do it all. We can bring bark out in smaller trucks if truck size and weight is an issue. Need Help Installing the Drain Rock? 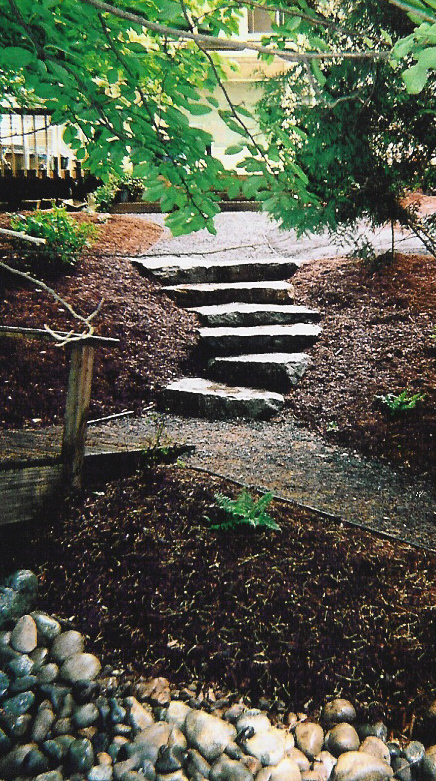 Drain Rock Delivered and Spread: We offer Drain Rock installations of all types as well as full landscape installations. Have a wet soggy landscape that needs to be resolved? Get that French Drain installed sooner than later! Estimates are free so please call and schedule an appointment today. For more information on services provided please see our service page. The 1 1/2 inch washed round is used often for French Drain systems and as an ornamental rock for borders along driveways. Often reffered as driveway border rock. Used also for foundation drain systems and for buried sump drain holes or dispersion trenches. The 7/8th washed round is often used for all kinds of drain systems including buried French Drains, skirt drains, foundation drains, septic systems and so on. Even used in some cases for dog runs (big dogs!). This is like the 5/8th minus crushed except it doesnt have all the fines in it. It varies in size from as big as approx 3/4 inch down to 1/4 quarter inch or less. It is used for tight line systems as far as drainage and for packing under the newly installed pipes. You should consult an engineer or city planning for your area to determine the exact material you need in any drainage system that requires a permit. No picture yet provided of the 1/2 washed round drain rock) This drain rock is slightly smaller then the 7/8th washed round. It is often used in the same applications as the 7/8th washed round but this drain rock will be more expensive. The 1/2 washed round rock is sometimes required on a job that is being inspected. Used for same applcations as 7/8th washed round but also often used for pathway as long as not on a hill due to slipping issues. Also used quite often for dog runs, play systems though Cedar Wood Play Chips at a 9 inch depth would be recommended instead. In some cases washed sand or granulithic gravel is used in play systems as well. Granulithic Gravel: This gravel is approx the size of steel B B's. Often used for play ground but you should consult city planning in your area to see if it is recommended. This rock is often not washed but is used in some cases for drainage systems. Often used as ornamental rock for driveway edges or smaller dry river beds in landscapes, especially around ornamental rotting stumps and logs. There is hardly ever a water feature installed that does not use cobble rock of some sort. Like the 2 to 4 inch cobble it is often not washed but fairly clean. It is commonly used for dry river beds in landscapes and other landscape projects. It is also sometimes used in drainage applications. From time to time it will be used in Gabion steel cage retaining wall systems as well. We do offer hand-picked cobble rock but it will be more costly then the unwashed 3 to 8 inch listed here. If interested in hand picked cobble you will need to specifiy over the phone that is what you need a quote on because all quotes given will be for machine loaded, unwashed cobble rock. It should also be noted that some of the rock will be bigger than 8 inches but is often does not exceed 12 inches. It is definitely a favorite with the landscapers in their design work. As stated above, there is hardly ever a water feature installed that does not use cobble rock of some sort, ant its usually the 3 to 8 inch cobble that is used. We have other types of drain rock and material that are not listeted. Call or email all questions you may have on material you are looking for at email and phone number listed below. Want A Price On Topsoil?